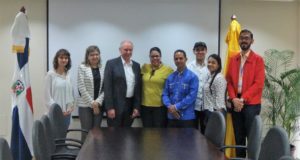 University cooperation planned – Dominican Health e.V. The Furtwangen University plans to extend its support with further students in a sustainable way. It also prepares cooperation with the University of Pontificia Universidad Católica Madre y Maestra in Santiago. During the first visit on site, there were great similarities in terms of content regarding medicine, public health, physiotherapy and nursing. At present, a cooperation agreement is being prepared between the HFU and the PUCMM. This forms the basis for future collaboration in research and teaching. From 2019, semesters abroad are conceivable.